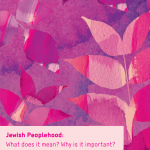 Themes of Jewish Peoplehood – now on video! Thanks to our talented friends at G-dcast we are delighted to launch six new short videos that explain and focus on the six core themes of Jewish Peoplehood. These themes, which are the central focus of the Education Toolkit, combine to create the multi-faceted concept that is Jewish Peoplehood. Check out the video below – focusing on Judaism as a Civilization. The others can be found here. Jill Blair: Why Are We Still Here? The Future of the Nation State of the Jewish People: Consolidation or Rupture? Professional Development Resource for Educators: Join our new seminar series! Get the CJPE blog straight to your inbox. Peoplehood Papers 13: What does Peoplehood mean? Why is it important? How do we nurture it?